This article on teaching What is TRIZ provides an example of how to prepare a TRIZ educational courses with the crossover QMS Android mobile application for quality improvements in development and improvement of Quality Management Systems, processes, procedures and services. The creative booster TRIZ technique encourages users to select inventive principles for solutions and then implement the right method for that improvement. 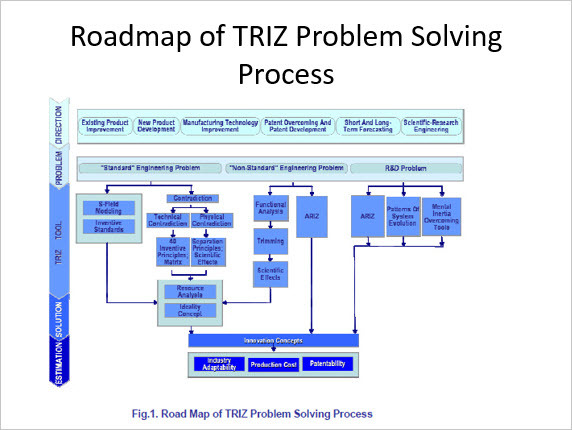 The TRIZ crossover QMS (Theory of Inventive Problem Solving x Quality Management System) solution enables the application of TRIZ tools and techniques in the world of quality management. It was developed to improve the creativity of manager teams and individuals. 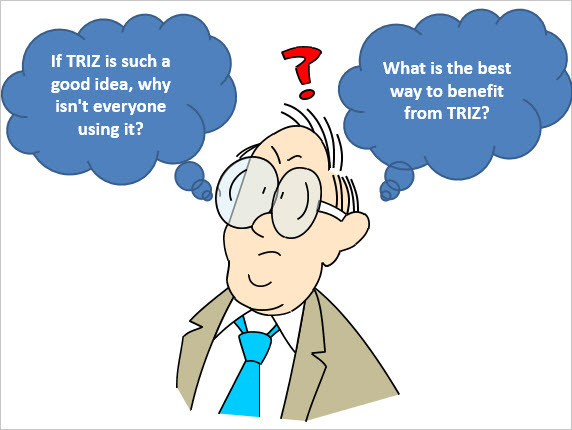 When reviewing What is Triz, initially one doesn't understand. TRIZ provides the direction of the solution but doesn’t hand over a fully calculated solution. The problem owner, when presented with an answer from TRIZ still must do a certain amount of re-designing to carry out the solution. See reference  for details. If you involve one’s best people, understanding what is TRIZ turns a good engineer into an excellent one. Institutionalization of TRIZ within an organization . According to  at Samsung, TRIZ provided the first good results after six months of its application on an industrial project in 2001. Samsung provided 120 hrs of educational courses to train experts in TRIZ thinking and the use of TRIZ tools and techniques. Usually in consulting projects, we encounter not enough time available for training. Therefor we find other ways to provide the knowledge needed by customers for successful competition of assignment (implementation of solutions prescribed by project team). In the article “TRIZ In Two Hours For Undergraduate And Masters Level Students!”, Dr. Paul R. Filmore describes his experience on teaching What is TRIZ . This includes informing students of TRIZ benefits, presenting some basic knowledge and providing on line documentation where students can find additional information. Many propose a strong belief that TRIZ is hard to learn. That it takes a lot of time and money to master it to a degree to use it for solving difficult problems. Well it is not possible to master What is TRIZ in 2 hours. But you can light a fire, providing educational course, easy to use software tool and enough information to get started solving problems. You can accomplish this by using the articles and case studies available in TRIZ Training Kit. This comprehensive package lets you learn and train the TRIZ technique with the easy to use TRIZ crossover QMS Application. Make it appealing that the learner wants to apply and share it. Keep it simple enough that the learner could easily imagine using it. Make it more effective than any tool in the learner’s current tool kit. Induce a mental knot in the learner. Presents a paradox that induces the learner to a ‘higher level of consciousness’. Break old habits / routines and replace them with significantly different approaches for all future occasions. In constructing a learning experience around TRIZ, use the following key areas which lay the foundations for TRIZ tools. Thinking outside the box and in a box implementation. Incremental Quality improvement vs. quantum leap improvement. Examples of good TRIZ solutions to seemingly unsolvable problems. Introduce TRIZ theory in such a way that students can feel that they can adopt it and that when they try using the tools, they work i.e., approachable and non-threatening! Prepare the What is TRIZ lecture in a way to create a need in the student. A need to learn more about TRIZ by himself with the aid of additional training material. Convince the students of the unique benefits and importance of the TRIZ methodology for designing or improving QMS, processes or services. By knowing what is TRIZ, you can design your own procedures with the superior benefits of the QMS and/or services. Your designed procedures align to the needs of your company. You use less resources thus creating advantage over competition. Using the TRIZ tools the goal can be achieved faster, easier and with fewer resources. Explain why the problem was chosen and why the solution is innovative and worthy of attention. Show the benefits and how it opens the doors for totally new applications. Make it the right level for the audience i.e., they can appreciate, be involved and comment on it. Show it clearly appears to the student as an innovation jump/ breakthrough in thinking. Provide support that ‘experts’ endorse it as a breakthrough technique. Case studies are the most important part of the lecture because they enable students to participate in solving a given problem. 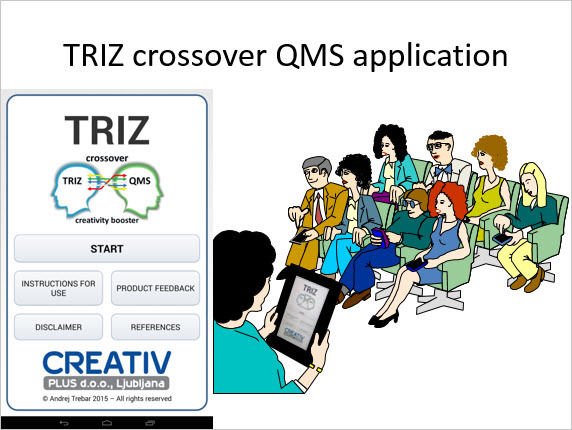 With the TRIZ kit, they get to use the TRIZ crossover QMS application on their smart-phones during the lecture. They follow the presenter’s instructions. Thus receive the necessary hands on experience needed for further studies. According to Dr. Paul R. Filmore, you should demonstrate that TRIZ has more potential than student’s other present problem solving strategies. The “TRIZ crossover QMS” application included within the TRIZ kit has both an educational and problem-solving power. You can use it to foster TRIZ thinking and to accelerate the problem-solving process. It is easy to navigate. Students can use it to follow the teacher during the presentation of case studies. This way students become familiar with the use of the application and with TRIZ thinking as demonstrated by the teacher. 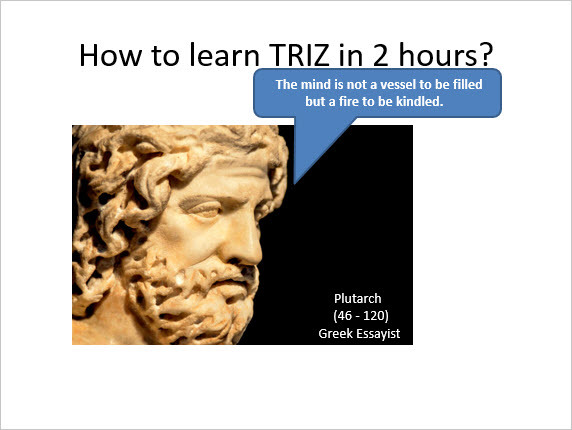 As mentioned before, to master What is TRIZ, it takes more than listening to a two hours lecture. In fact it takes several months of study training materials, theoretical background of TRIZ and a lot of case studies (starting with very simple and proceeding to more complex ones). 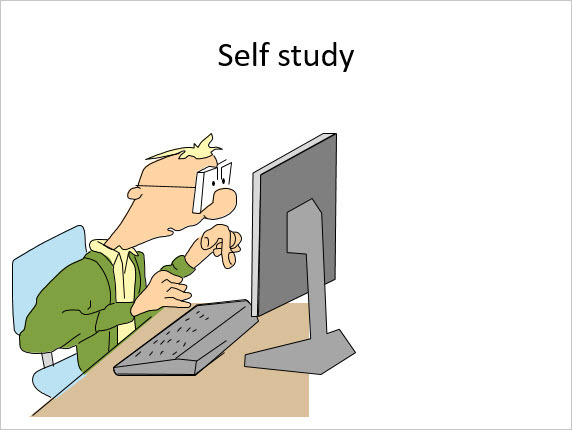 A great resources for self study is the TRIZ Training Kit.